The pickle is in peril. Each summer since the mid 2000s, Florida winds carry downy mildew to cucumber fields north. By summer's end, the disease reaches Michigan, leaving a trail of withered leaves and thwarted pickling plans. "This is the number one threat to the pickle industry," says vegetable pathologist Lina Quesada-Ocampo of North Carolina State University. The growers, she says, lose money on failed crops and pricey fungicides. "It is a really bad double whammy." Fortunately for pickle lovers, vegetable breeder Michael Mazourek of Cornell University is close to releasing varieties that resist downy mildew. "It's been one of our proudest David and Goliath stories," he says. But his success hinges on funding at a time when public support of agricultural research is declining. The story of saving the pickle, then, is not just about preserving the deli sandwich's sidekick. It's a story of how much we value our food supply. And who we think should pay to protect it. Cucurbit downy mildew, caused by the fungal pathogen Pseudoperonospora cubensis, was once a minor nuisance. Starting in the 1960s, a Clemson University plant breeder, Carroll Barnes, produced a series of cucumber cultivars containing a strong resistance gene known as dm-1. For more than four decades, this gene helped keep the disease in check. But in 2004, the pathogen overwhelmed the defense. In North Carolina, pickling cucumber growers were a third of the way through harvesting when downy mildew arrived. Within about a week, the crop "almost melted," says Thomas Joyner, president of Nash Produce. "It burned the leaves and there was almost nothing left." That year, downy mildew struck cucumbers from Florida to New Jersey. The following year, it reached Michigan, the number one pickling cucumber state. And it has spread from Florida every summer since. "I have never seen something that moves this fast and is this devastating," says Quesada-Ocampo. "You see a lot of brown, dead leaves on the ground, and cucumbers ... almost becoming bleached white because of the sun scalding." Growers turned to fungicide, but downy mildew quickly adapts faster than the industry can release new ones. "Some that were very effective just a few years ago are absolutely ineffective now," says Phil Denlinger, vice president of agricultural procurement for Mt. Olive Pickle Company. "It is a serious situation." "Every year we wonder, will our tools hold up?" says plant pathologist Mary Hausbeck of Michigan State University. As extension specialists for each of their states, Hausbeck and Quesada-Ocampo test fungicides and advise growers on methods that remain effective. In 2014, Hausbeck was becoming increasingly concerned about running out of means for growers when she approached Cornell's Mazourek with a personal plea for help. As she saw it, the industry was at terrible risk and, having grown up in Michigan pickle country, she hated to see it collapse. She recalls Mazourek listening politely and then saying, "You know, we might be able to do something." Mazourek had already developed a downy mildew resistant slicing cucumber, the kind we eat fresh on a salad, by crossing two cultivars with moderate levels of resistance and then selecting the most hardy offspring over multiple generations. Vegetable breeder Michael Mazourek is working to develop cucumbers that have both the best pickling traits and are most resistant to downy mildew. But a pickling cucumber is a different cuke altogether. Unlike the much smoother slicers, pickling cucumbers have enough bumps on the skin for brine to pass through, and seed cavities that don't disintegrate during that process. And those destined to become pickle spears must fit neatly in jars. Accepting the challenge, he crossed his slicing cucumber with pickling cucumbers already on the market and selected the most disease resistant and pickle-like offspring. He tested plants in Florida, New York and Michigan to select for cucumbers that could resist downy mildew across the planting range. In 2017, Hausbeck invited a few pickling cucumber growers and processors to meet Mazourek and assess his progress. Downy mildew had already swept through the MSU experimental farm, but the leaves of Mazourek's plants were mostly green. "The growers were just about ready to hoist him on their shoulders and carry him through downtown East Lansing," says Hausbeck. But they also told him that many of his cucumbers weren't quite pickling ready. Some, for example, had pockets between the seed cavity and flesh that could cause the center to fall out of a sliced pickle. Others were simply too short to make enough crosswise slices to top hamburgers. Mazourek took cuttings of the plants the pickle experts liked best. He then crossed some and self-pollinated others to make the next generation of new and, hopefully, improved pickling cucumbers. If downy mildew prevails, the pickling cucumber wouldn't be the first crop lost from a region. A century ago, a related downy mildew helped drive commercial hops from the Northeast to the Pacific Northwest. In the second half of the 19thcentury, coffee leaf rust wiped out the plantations of Ceylon, now Sri Lanka, pushing growers to switch to tea. Crop pathogen problems may only get worse. "I've been doing plant pathology research for more than 30 years, and we're seeing more threatening plant diseases now than in the past," says plant pathologist Jean Ristaino, who directs N.C. State's Emerging Plant Disease and Global Food Security program. The change stems, in part, from global trade. "Over the past 100 years, there has been more movement of plants, and the volume is much higher, so it is harder ... to monitor all the pests and pathogens coming in," says Ristaino. Climate change is also a factor. Fungi could move to where it was once too cold. And with milder winters, seasonal pathogens could become year-round residents. Faced with these challenges, Mazourek recognizes that any pickle fix may be temporary. "The last resistances that were deployed lasted for decades. While we hope that's true, more and more we're seeing new diseases, faster evolution of diseases," he says. Despite these threats, U.S. public spending on crop protection is declining. According to the USDA, total federal and state funding for agricultural research and development fell between 2002 and 2015 from about $6 billion to $4.4 billion. Meanwhile, Brazil, India and China increased spending, with China surging to about twice U.S. levels. Agricultural researchers at land-grant universities like Cornell, MSU, and NC State once received enough set federal and state support to cover their programs. With this funding declining, they must apply for competitive grants from the USDA and other institutions to make up the difference. 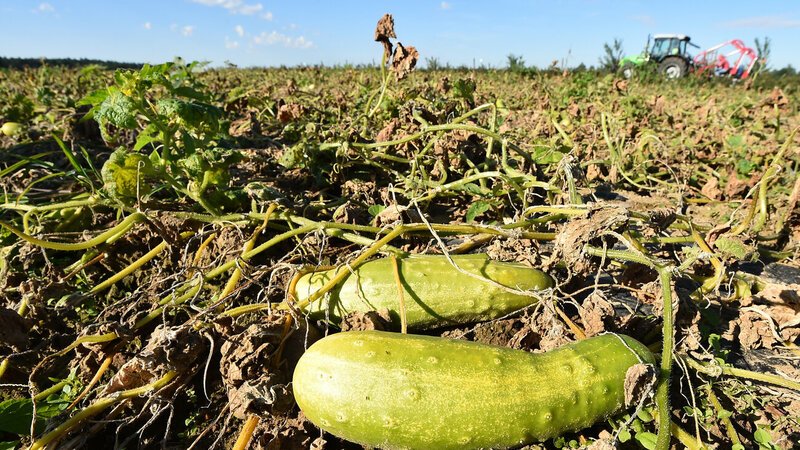 In the competition for funds, crops like the pickling cucumber are often passed over for crops that cover more acreage, says Quesada-Ocampo. N.C. State plant breeder Todd Wehner says there were many more publicly funded cucumber breeders when he began his program nearly four decades ago. But today, with less funding, there are far fewer jobs. In fact, Wehner and Mazourek are among the last few still breeding. Though public funding is waning, private investment in agricultural research and development, not including food manufacturing, increased from about $3.2 billion to $6.3 billion between 2002 and 2014, according to the USDA. And the pickle has profited. Nischit Shetty, a geneticist for Seminis, a Bayer Crop Science vegetable seeds brand (formerly of Monsanto), led efforts to develop the first two commercialized pickling cucumber hybrids resistant to downy mildew. Released two years ago, Shetty says that they remain the only two such hybrids on the market. But they don't fend off downy mildew completely, so growers must still use at least some fungicide. Private fungicide research has also protected pickles. When downy mildew first struck, the pesticide producer Valent stepped in with a new fungicide called Presidio that was initially very effective. Unfortunately, the pathogen evolved resistance to Presidio within a few years. Other companies also developed fungicides. The industry advises growers to rotate sprays to limit the pathogen's chances of adapting to any one of them. But one consequence of our increasing reliance on agriculture companies is that growers foot a larger portion of the bill, says Wehner. Companies must charge growers enough to make a return on investment. Alternatively, public research expenses are spread across society, and the results of that research are shared openly. "It really comes down to: Do Americans want to help with their food production system, or do they want it to fall on the shoulders of the growers?" says Wehner. 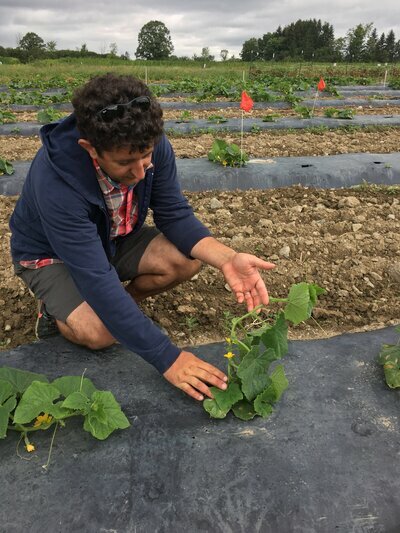 In late September, Mazourek sat in a room on an MSU experimental farm with his graduate student and lab technician, laying out their pickling cucumber vision for seven growers and processors that Hausbeck invited, including some who assessed Mazourek's plants last year. Breeders often cross two plant varieties, each genetically uniform, to make a new "hybrid" variety that boasts the best genes from each parent. But because downy mildew is quickly evolving, the best genes for resistance in 2018 may not be the same for the years ahead. Rather than a hybrid, Mazourek described developing what are called open-pollinated varieties. Each of these varieties is really more like a population of plants that each have slightly different sets of genes, all growing together in a field. Mazourek observes which cucumbers are the most disease resistant and have the best pickling traits and then chooses those to keep in the gene pool for the next generation. The plants are uniform enough for repeatable results, but genetically diverse enough to resist whatever tricks downy mildew might devise next. "By having that mix of plants, the disease can't really get a foothold," said Mazourek. "And if it does, it can't wipe out the whole field, and we can continue to, every year, find the most resistant plants and select from that. And it just keeps evolving." A seed company could continue this process, but so could a grower, just by saving some seed from the best plants for the next year's planting. Later, the group arrived at the field where Hausbeck was testing Mazourek's progress. Before them lay about 500 cucumber plants, most with barely a hint of downy mildew. The growers and processors spread out, cutting open "pickles," as they dub them even before brining, and staking pink flags by promising plants. One cucumber got flagged for a seed cavity without pockets. Another's boxier ends meant squeezing more slices out of a pickle. After much enthusiastic cucumber slicing and squeezing, the pickle experts left and the Cornell team and Hausbeck stood gazing at their glowing assessment — 30 pink flags across the field. There was still room for improvement, Mazourek concluded, but it was time to scale up. They were close enough that some growers could test the plants next year. He's eager to release something fast. Downy mildew isn't getting weaker. And the funding clock is ticking — unless renewed, USDA support for Mazourek's pickle program ends in 2020. But for now, pickle prospects look good — at least according to grower and fermenter John Swanson's evaluation of Mazourek's plants. "They're alive," he says. "And they're pickles."